Dodge has developed yet another model for the special services, this time with their 550-mile range Durango. Dodge has created another model for the men and women who keep our country safe. The 2012 Dodge Durango Special Services edition can be configured in either rear- or all-wheel-drive and depending on need, can be equipped with either a Pentastar 3.6-liter V6 or Hemi V8 engine. When hooked up with the right gear, the impressive Durango can tow 7,400lbs. The Durango Special Services features an array of customizable options depending on need. They include bull bars on the front, interior lighting, bigger brakes, 220-amp alternator and engine cooler. 45 other options are available as well. "We&apos;re incredibly excited to add the Dodge Durango Special Service to our line-up of law enforcement vehicles," said Peter Grady, Vice President of Network Development and Fleet Operations. "Adding Durango to our current Dodge Charger Pursuit and Ram 1500 Special Service vehicles allows us to offer a full range of fleet sedan, SUV, and truck options to law enforcement and government agencies." While equipped with the Pentastar V6 engine, the Durango SS can go a range of 550 miles without stopping. Check out the photos of the Fire & Rescue and Police versions of the Dodge Durango below. 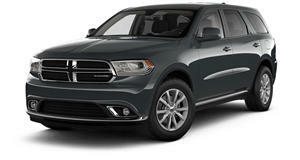 The Dodge Durango is a good all-round SUV – albeit one with some glaring issues.